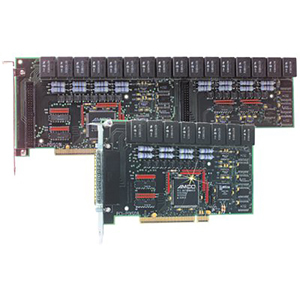 The PCI-PDISO16 and PCI-PDISO8 combine isolated AC or DC inputs and electromechanical relays on a single PCI-bus compatible board, for IBM or compatible PC’s. The PCI-PDISO16 provides sixteen 24 V AC or DC inputs and sixteen form C, 3-Amp relays. The PCI-PDISO8 offers eight 24 V AC or DC and eight 3-Amp relay outputs (five form C, three form A). A software enabled input filter is available on all channels. 50-pin screw terminal board. Two required for PCI-PDISO16. Each CIO-MINI50 also requires a C50FF-2 cable. 37-pin screw terminal board. One required for PCI-PDIS08. C37FF-2 cable also required. 참고: The PCI-PDISO series comes with InstaCal installation, calibration and test utility, Universal Library (programming libraries for Windows XP SP2/Vista/7), LabVIEW drivers and complete operator’s manual on CD.